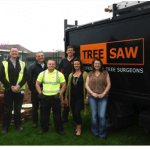 Treesaw is a professional tree surgery firm in Wakefield undertaking arboriculture for residential customers, Local Authorities and a variety of commercial businesses. 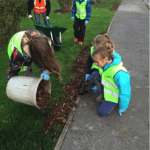 As well as having hundreds of satisfied homeowners in Wakefield we are the current appointed arboricultural contractors to Wakefield and District Housing Ltd., Wakefield Council and several other property, building maintenance, construction and landscaping companies in the area. 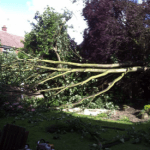 Treesaw is able to offer a complete requirement for tree maintenance services including a 24 hour emergency response service. 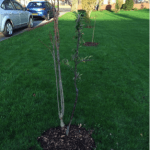 Our core services include crown cleaning, crown thinning, crown reduction and shaping, crown lifting, pollarding, removal of epicormic growth, removal of deadwood, felling/dismantling of trees to ground level, stump grinding or the chemical treating of stumps using Eco Plugs and tree and hedge planting. Based on our track record of carrying out these services we are confident that we will be able to carry out every aspect of arboriculture to a consistently high standard. Treesaw removed two Beech trees and stumps in a large garden following a survey of their condition. 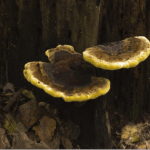 The first tree had a large cavity on its main stem with Inonotus cuticularis fruiting bodies within the cavity, which cause white rot. At the base of the tree Kretzchmaria deusta, a pathogenic fungi which attacks the roots of the tree and causes soft rot were found to be present. Another Beech tree with a large cavity extending from 2.5m down to the roots was also highlighted for removal. Both trees were reported to have a life expentancy of less than 10 years. 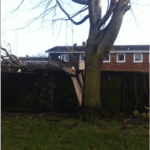 Treesaw obtained permission from Wakefield Council before undertaking work to fell the Beech trees in January 2016 as they were situated within a Conservation Area. A Risk Assessment was undertaken to avoid excessive rigging and climbing of the trees which were in a very poor condition. Treesaw has been providing a 24 hour emergency call out service to Wakefield & District Housing since 2011. Since then we have attended every emergency for which a request has been made, over one hundred in total both during the day and night. 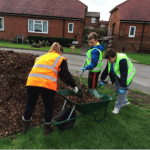 Treesaw has helped numerous community projects in Wakefield by transporting and donating wood chip and logs for schemes including the Community Payback Scheme, Sharlston Children’s Centre and the ‘Love Where you Live’ scheme at Pontefract Barracks and Benson Lane Bungalows in Normanton. 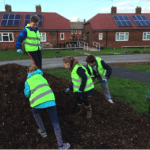 Treesaw delivering wood chip materials to Sharlston Childrens Centre, Wakefield, May 2013. “Mark/Richard, thanks for donating the chip and logs today, it is much appreciated.” Landscape Manager, Wakefield & District Housing. Treesaw delivering wood chip materials and participating in a communal gardening scheme, Benson Lane, Normanton. November 2015. Tenant Involvement Officer, Wakefield & District Housing. 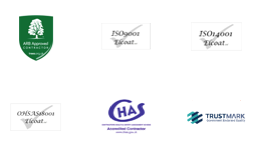 For more information about other projects and schemes we have been involved in locally see our Commercial Projects Page.